Early Monday morning a US Navy Destroyer collided with a merchant vessel off the coast of Singapore. The US Navy initially reported that 10 sailors were missing, and today found “some of the remains” in flooded compartments. While Americans mourn the loss of our brave warriors, top brass is looking for answers. 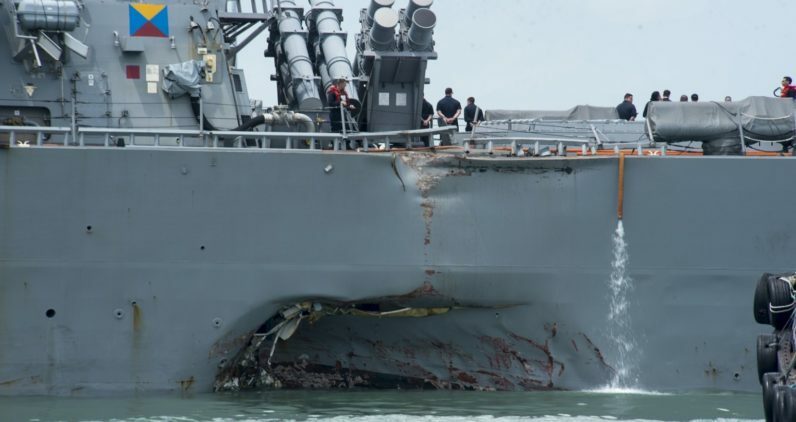 Monday’s crash involving the USS John McCain is the fourth in the area, and possibly the most difficult to understand. So far this year 17 US sailors have died in the Pacific southeast due to seemingly accidental collisions with civilian vessels. There are only a few reasonable explanations for the increase in US Navy-involved collisions that appear to be isolated to this one particular region of the map. The crashes could be due to a lack of proper training, an act of war, terrorism, or coincidence. The first US Navy collision this year occurred in January, when the USS Antietam ran aground near Yosuka, Japan. The USS Champlain was the next ship to crash, colliding with a South Korean fishing vessel in May. According to reports Navy personnel spotted the fishing craft and tried to contact it, but it lacked a radio and GPS. It’s pretty strange to think that a South Korean fishing boat wouldn’t have GPS — almost beyond belief. Navy leadership has issued new training directives in response to the crashes, but that’s standard procedure for any military event. The US Navy works on a “lessons learned” methodology; leadership treats every failure as a teaching tool and immediately implements new training procedures. It’s still possible that the 7th Fleet dropped the ball and consistently placed untrained sailors in positions and situations that were bound to result in an eventual loss of life. We may also consider no matter how well-trained a person is, sometimes mistakes are made — we’re only human. Should four collisions in the same geographical area be chalked up to coincidence? Let’s also consider that the current generation of sailors have been at war for their entire careers. The longest war in US history may be affecting the entire fleet’s readiness. But if we don’t believe that the fault lies with the sailors who were standing the watch during each collision, we’re left with the suspicion of some form of attack. TNW recently reported on the ease with which hackers were able to breach civilian ships. Could a military vessel be hacked? In essence, what if GPS spoofing or administrative lockout caused personnel to be unaware of any imminent danger or unable to respond? The obvious suspects — if a sovereign nation is behind any alleged attacks — would be Russia, China, and North Korea, all of whom have reasonable access to the location of all four incidents. It may be chilling to imagine such a bold risk, but it’s not outlandish to think a government might be testing cyber-attack capabilities in the field. If that isn’t bothersome enough there’s a third hypothesis. This may very well be the next wave of terrorist attacks against US military personnel. Terrorists have attacked US Naval vessels and killed sailors before. In 2000 the USS Cole was attacked by terrorists who drove a small boat loaded with explosives into its hull while the ship was docking. That attack left 17 sailors dead and nearly 40 injured. Terrorists typically take responsibility for attacks though, and we weren’t able to find any reports of this being the case in 2017. Al Qaeda claimed the attack on the USS Cole and investigations were able to confirm that to be the case — this preceded the 9/11 attacks. While it remains within the realm of possibility that these are isolated incidents that have no connection, the frequency with which the collisions are occurring might suggest something other than human error at fault.